The 12 Days of Christmasneedlework give-away series is over, though you still have time to enter comments on the give-away posts! So if you haven’t entered yet, jump to it! I think the series has gone well. Who knows? Maybe this can be the beginning of a Christmas tradition on Needle ‘n Thread! I hope you enjoyed the series as much as I did. The fun part for me – besides preparing it – was reading all the comments! My goodness, there were lots, and I enjoyed them all! Yes, I do read them – each one – as those who received e-mail replies can attest. They always put a smile on my face, or thoughts in my head, or inspiration in my heart. Thank you for participating! An especially Great Big Huge Thank You to the generous contributors to the series, each of whom was mentioned in the post on their give-away day. I hope, when you’re looking for good needlework supplies, you remember these brave and creative people who make their living from the needlework industry, supplying us with the things we need to pursue our passion and make that pursuit more pleasurable. The comment sections on each post in the give-away series will close on Monday, January 9th, around 5:00 am CST (that’s in Kansas, USA). This means you still have a couple days to add your comments to any of the posts in the give-away to be eligible to win. The winners’ names will be drawn randomly on Monday morning. Each post is “inclusive” – that is, the winners for each particular give-away are drawn only from the comments left on that particular article. If you entered each give-away, that’s great! It increases your chance to win something, and if your name happens to be drawn more than once, well – that’s the luck of the draw. So if you have your heart set on winning one item especially, but you’d also like to enter the other give-aways, feel free! The one rule for the winners is that they must contact me within 72 hours with their mailing information. After 72 hours if I haven’t heard from any winner, I will re-draw for that particular prize. And that, my friends, is it. Thanks for the fun time! After Monday, we’ll be getting back to “routine” here on Needle ‘n Thread. I’ve got quite a few project updates for you, some tips and tutorials, and other stitchy stuff coming up! So stick with me – 2012 promises to be an adventurous year! January 16, 2012 Inspirations Magazine – Drawing Again for a Winner! Thank you for a great blog and for the wonderful giveaways! Thank you again for this wonderful giveaway, hopefully everyone who wins will put their prizes to good use and we will see some lovely needleart emerge. But more than this contest I want to Thank You for this wonderful blog and all the time and energy you spend to help inform the world about needlearts. This is really one of the best needlework blogs written. Thank you. Thank you so much Mary for organizing all this!! Of course, I hope to win, but to discover all these wonderful product is already a big gift!!! As I’m new to fine needlework (I’ve mostly done cross-stitch before), it’s a great education to learn the tool of the trade. Thank you again and again for your time and dedication for teaching freely and generously all of us what your exceptional talent made you discover. Mary: It was a fabulous 12 Days and your prizes were all wonderful – many thanks to you and to the generous donators. Most of the companies and designers you feature end up on my Favorites list. Enjoy your weekend. Janet. This has been so much fun for me. I, too, read the comments. I have learned a lot from reading them and from perusing your blog. I just found it and I will be a follower. I have learned so very much. I am looking forward to 2012 with Needle n Thread. Thank you for this giveaway and this wonderful blog!!!! “So stick with me” gave me a warm smile. Don’t know as one could class it as a statement but, whatever, I reckon it’s the understatement of the year, and wer’re only up to day 7. How could we do anything else but stick with you? Well…until the prizes are drawn anyway! Truly though Mary. Perhaps this might help sum it up – “Drumroll for a New Year with Mary please….Thank you, thank you”! After writing that for 12 days straight just ‘Kath’ looked a bit lonesome! I really enjoyed it and am looking forward to monday. I’m also looking forward to seeing how much (and how) you have progressed on your medallion project. Hi Mary. Thank you for this marvelous 12 days. I have thoroughly enjoyed the daily anticipation! Each giveaway is worth acquiring. Fingers crossed. Thanks Mary for all the inspiration and generosity you have exhibited through this give away. I was so enamored of the footstool shown in the inspirations page that I went to Country Bumpkins web site to order it and discovered that there were several more issues I wanted. They had a special on for 5 back issues so I found 5 that looked irresistable. If I don’t win the subscription, I’ll subscribe anyway. Again, thanks for sharing your time, yourself, and your love of all things stitching. A good time was had by all could easily be written about these 12 days. Love the site and wonderful tips and tricks. Look forward to another year of learning.. Teresa C.
What an embarrassment of riches you have set before us! Your generosity abounds! 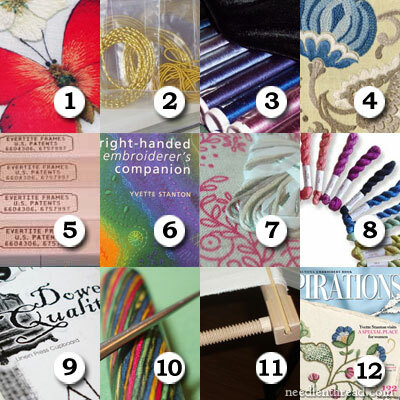 Thank you for your 12 Days of Christmas Needlework Giveaway Series. Many thanks to your generous suppliers as well. Oodles of family (but no complaint there) and midterm exams begging grading have limited my time on your site. I have managed a few minutes every couple of days to at least peek at the offerings – they are so inspiring! Thank you for all the chances to win and for the fun of the anticipation throughout the series. Now I’ll post comments, and then I’ll tackle the Christmas tree. Happy New Year! I hope yours is filled with many blessings and much happiness and that it keeps you in stitches! Thank YOU Mary – it’s been such fun to read your post each day to see what the latest goodie might be. You and the sponsors have been very generous and I’ve enjoyed participating in (and reading) the comments. Even if I don’t win anything, it’s been a total blast! I’m looking forward to see all the fun articles you’ll have for 2012. I can FEEL myself learning already! Thanks for doing this Mary! It was a lot of fun, and I did read some of the other comments also, they were interesting. I don’t really care if I won anything. I have learned so much from your posts and been inspired to learn more. Thank you for all your hard work on this and Happy New Year! Sitting down with a cup of tea and opening your email each morning to learn what the day’s giveaway would be was like a little present. All of the lovely items provided inspiration for the new year. I can’t wait to see what your first project of 2012 will be. Thank you Mary for the 12 days of giveaways and for the wonderful information you provide all year long. Hi Mary. Thankyou so much for the last 12 days. It has really been something for me to look forward to each day. The weather here in the UK has been stormy on many days in the last 6 weeks, and we have needed something like this to lift our spirits. Now the roof has been mended, and all that remains is to re-paint the ceiling where the rain was dripping through! There was such a variety in the giveaways, and the sponsors have been so generous. When they know how many of us have left comments to try to win, they will surely want to donate on another occasion. And I’m also sure that we have been inspired by just looking at the goodies, and following the links to the suppliers’ websites. Once the New Year begins everything usually feels a bit flat, but with the 12 days there was not chance of that. Each day you and your sponsors brought us something new. When I saw the beautiful Renaissance crewel wool I just had to order some straight away, I had entered the draw but as the last time I won anything was over 16 years ago, I thought I’d hedge my bets. If I win and end up with two sets, firstly you’ll have to scrape me up from the floor because I’ll be totally gobsmacked, but it will mean I’ll be able to do double the projects. Thanks Mary. I should have included in the last comment of the draw that I find this site and the work you do inspiring. I especially love your blackwork fish. Thank you for this opportunity. I learned a lot about resources that have not been familiar to me before (like the millenium frame). Rather than trying to remember to check your site periodically and then forgetting in the info overload, you are now my homepage! I thank you very much Mary and also the generous contributors.I was very Happy to take part in this 12 days. Thank you to all of the contributors, and thank you for doing the giveaways. It was a fun and welcome distraction to look forward to during a sad start for my new year. I look forward to reading more reviews and tips! It WAS great fun, Mary. And the sponsorship was great. Besides the fun of “what will she be giving away today?”, I enjoyed how you presented each give-away. And if I don’t WIN every one I signed up for (haha!!) I’m gonna have to go out and buy some of this stuff!! I’m just a needlework junkie! Thankyou for so much fun! And the work you put into organising it all. I just want to say A BIG thankyou to you and the contributors for the wonderful giveaways over the 12 days of Christmas. I have enjoyed every day wondering what the next giveaway would be. It was such fun and a good idea especially after Christmas when life for many seems a bit dull. Thankyou Mary for your hard work and continued support and inspiration. This HAS BEEN a lot of fun, Mary! I also learned a lot of things from products I never heard of before. I AM looking forward to you continuing your progress reports, though. Thank you for such a wonderful giveaway series! It goes without saying that this has been a wonderful series of giveaways and a lot of fun. It’s been really great to have a bit of excitement AFTER Christmas – keeps the festive spirit going a bit longer! Thank you so much! A great BIG thanks to you, Mary, and to all the generous contributors as well! This was fun, thought-provoking and brought a group of embroiderers together during this wonderful time of the year. Good job and God bless you for it, my dear. It would be fun to win, of course, and it does give me a bit of a tickle to think of the goodies lying there in wait, but I hope everybody feels as lucky as I do that we were able to play! Happy New Year! Thank you Mary! This has been so much fun, and has introduced me to (or reminded me of) so many of the sources I will need when I finally organize myself into a project. I imagine this has been a big project for you, and so I want to thank you for arranging it all, and why not, while I’m thanking you, a big heartfelt thanks for your amazing blog. It’s so jam-packed with good stuff that sometimes I save reading a post for when I’m quietly resting with a cup of tea, the way I’d savor a really interesting magazine, or good book. Mary I am in awe at how much time and effort you put into your blog; such genorosity of spirit from you. Your (almost) daily missives land in my email automatically. You have no idea how very much I enjoy them and how much I learn from them. Even if something is not of immediate usefulness, I know I can search your site if I have an embroidery problem and so far, find the answer because of your needlework and internet skills. I have enjoyed participating in the giveaways very much. The contributors are to be lauded for getting on board but it is your wonderful way with words and expertise which makes your blog so special.Long may you continue with it. God bless you. Thank you so much for all the fun great prizes!! I am inspired to get my embroidery out and learn from your site! I appreciate everything I read and love seeing your project updates! Thank you Mary, and a big thank you to the suppliers and everyone who made the past 12 days so fun! I’ve enjoyed reading many comments, just to see what the variety of ideas and responses were. It has been a great learning adventure, as everyday with Needle ‘n Thread is. I’m looking forward to seeing how many of the projects are going, and the upcoming online classes. Here’s to Happy Stitching in 2012! Thank you so much Mary Corbet…Though I don’t observe the 12 days in the traditional sense, it’s spinner’s roc day today, and so for many people, it’s back to the wheel! I have enjoyed your site and this series these past two weeks. I’m also looking forward to Monday and finding out who wins! But as I wrote in one of my earlier comments, I feel like a winner already with all the new site links and the opportunity to read so many wonderful comments. It is amazing how many people follow this blog – so often I feel all alone in my fibery pursuits, but the electronic net truly ties together us across the globe. Every morning I look forward to reading your newsletter. You have been a companion for over a year now and I am very grateful that you dedicate your time to helping us newbies with our needlework. I will continue to look forward to your articles. Many thanks for making the after Christmas doldrums a lot brighter. Have enjoyed each day’s surprise, and even if I don’t win, it was such fun to participate. As someone else noted, it will be difficult to get through the weekend with all my fingers crossed. Also a big thank you to all the contributors of this giveaway. So generous of them. Will definitely have to do some serious online shopping this coming year if finances permit. I have already set up a small saving account so I can start saving my pennies. I just wanted to thank you for everything… The 12 days have been so much fun even before the 12 days I have enjoyed so much your website and the wonderful info. you share with us all… May God Bless you and Keep you. Thank you for hosting this wonderful giveaway and for the generosity of your donors. It has been fun watching what would be offered next. I think the best thing I like about your site is that you are not afraid to share your mistakes with us, and you sometimes even ask for our opinions! That makes me feel that I, too, can accomplish great things with embroidery! I am not so intimidated to try new techniques or to use new fibers. Thanks so much for your encouragement to us all. Like all the others, thank you so much Mary, for organizing this give-away, which must have taken quite a bit of time, and for what you give to us every day. Happy New Year! I always enjoy visiting your site and seeing your new stitcheries and tutorials. I have made a few as gifts for friends this year. Thank you, Mary. You rock! Well Mary it has been great fun and will be even more fun for the lucky winners. A huge thank you to you and the contributors for some really wonderful prizes, it is extremely generous of you all. I don’t know where you will find time to read all of the comments. I read a fair few each day and there were some wonder responses, they were as much fun as the give-away itself. Good luck to everyone and thanks again, Mary and everyone who contributed a prize. Mary, I too want to thank you and your contributors for all you have given. I also want to thank you for telling of the 12 days and what the actually are. I have been eagerly reading your blog for several years now and Love it! It brightens my days. Thank you for all your hard work to keep us in the know and showing us the joy of needlework. We need to come up with a new word for needlework…its not work for me its therapy, it keeps me calm and stress free!!!!!!!!!!!! Morning Mary…it’s Sunday…and I’m missing not seeing you post. Just wanted you to know that. Everyone needs a day off…and I’m not complaining that you have one…just wanted you to know that I enjoy your posts and look forward to them. Sending hugs! I hope I win I love this site and it would be a great help if I could win. I am a senior and always looking for something to do. The fact you even did this awesome. I have been glued here for almost a year as I got back into the swing of things with needle painting, bead embroidery, and just sewing . Even if I don’t win, thank you for doing this and for all of the work you do. Your tutorials,pictures,advice, and stories have re-inspired me to get back into the fray (so to speak). My biggest issue with getting back into everything is not having good enough materials and the fact you got people to contribute to give to others is commendable. I hope 2012 is a banner year for you Mary. You have already given a wonderful gift to so many in creating and maintaining this wonderful site. Bless you. Mary, Mary, Mary. Thank you for all the time, effort and preparation that went into making this event such a success. From you, through us, may generosity flow to everyone we come across. I like your line about thanking the contributors who make a living from being part of the embroidery business. Brave and generous, they certainly are. May their tribe increase so we’re always surrounded by creative and unique interpretations of life’s beauty. I have enjoyed following along for the last year. And have also learned so much from all the other resources you offer here. Thank you for all the work you put in and please don’t stop anytime soon. thank you so much for the chance to perhaps win one of this awesome gifts. It’s been fun too, to read about all the offerings. Just wanted to add my thanks as well 🙂 And I think that this 12 Days of Christmas Giveaway was a fantastic idea – and already quite a success, looking through the numbers of comments, Congratulations! – and really hope you consider making it an annual event!!! Thank you for all the nice gifts you made available, the valuble information and resources you made available for everyone. Thanks so much for putting together this giveaway! I was trying to get in some submissions just under the wire (it’s 12:30pm here on the west coast, but the comment box is already absent in your giveaway postings! How sad for me! If there’s still time, I’d like to enter to win some – please let me know how. Boy did I miss out! I would have LOVED that millenium frame….ahhhhh well….. Previous Previous post: Twelfth Day of Christmas: Inspiration! And Something for Everyone!